(San Luis Obispo County, CA) â€“ Visit San Luis Obispo County, the countyâ€™s destination marketing organization, and Cal Poly have partnered to launch a new program titled Poly Parent Adventures. Positioned to encourage mid-week tourism during Cal Poly Week of Welcome (Sept 17 â€“ 19, 2014), the program encourages parents to make dropping off their students at school a memorable experience for students and parents alike. Parents of Cal Poly students have the opportunity to experience various San Luis Obispo County activities through value-added deals and packages provided by local tourism partners. The Cal Poly Week of Welcome (WOW) program provides incoming freshman with an opportunity to meet their new living community, become acquainted with their major and various organizations on campus, and make social connections. In addition to the arrival of students, WOW will welcome more than 5,000 parents to San Luis Obispo County, dropping off their freshman at college. The Poly Parent Adventures launched at the beginning of July 2014. Visit San Luis Obispo County and Cal Poly will be working together to market the program through various advertising channels, including print, online and social media. To see the Poly Parent Adventures website, visit www.VisitSanLuisObispoCounty.com/Poly-Parents. Founded in 1901 and part of the renowned California State University system since 1960, Cal Poly is a nationally ranked, four-year, comprehensive polytechnic public university located in San Luis Obispo, Calif. Known for its Learn by Doing approach, small class sizes and open access to expert faculty, Cal Poly is a distinctive learning community whose 19,000 academically motivated students enjoy an unrivaled hands-on educational experience that prepares them to lead successful personal and professional lives. Visit San Luis Obispo County is the destination marketing organization for San Luis Obispo County, promoting the area as a preferred tourism destination for regional, national and global visitors through advertising, marketing, public relations and group sales. Highlighted by its culinary, cultural and coastal aspects, San Luis Obispo County is internationally recognized as a premier wine, food and life-style destination on California&apos;s Central Coast. Visit San Luis Obispo County has a member base comprised of over 500 tourism industry-related businesses including lodging properties, restaurants, wineries, golf courses and retail stores. 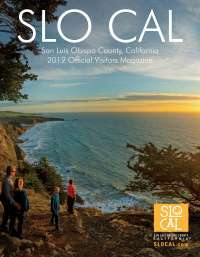 We invite you to visit the website at: www.visitsanluisobispocounty.com for story ideas or to request a county Visitor&apos;s Guide.